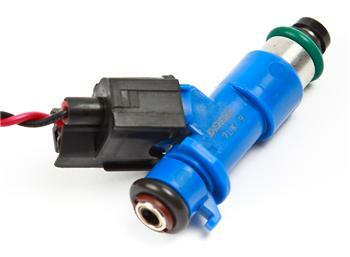 K-Tuned is now offering sets of OEM (Denso) Acura RDX injectors. These injectors are rated for 410cc (at 38 psi) and 550cc (at 70psi) and offer a much improved spray pattern over the factory Type-S (310 cc) injectors. These features offer the K-series engine increased fuel flow and better fuel atomization. They are the perfect upgrade for stock and modified N/A K-series engines. Stock bottom end motors with cams, valvetrain and upgraded intake manifolds may already be maxing out the duty cycle of the factory Type-S injectors. Please note that Kpro or other engine management is essential to control these higher flowing injectors.You can choose to buy a set of 4 injectors only or buy them as a combo kit with injectors and pigtail clips. We are also selling the pigtail clips for people who just need them. K-Tuned RDX Injector Hats were designed to allow B and D series owners to install oem RDX Injectors on their older engine applications. This injector setup is a very cost effective alternative to expensive aftermarket injectors and is much simpler and better than the popular DSM injector modifications. RDX Injectors are rated for 410cc (at 38 psi) and 550cc (at 70psi) and offer a much improved spray pattern over factory and most aftermarket injectors. These features offer your B or D series engine increased fuel flow and better fuel atomization. They are the perfect upgrade for stock and modified engines. Stock bottom end motors with cams, valvetrain and upgraded intake manifolds may already be maxing out the duty cycle of the factory injectors, and turbo builds most certainly will. Sold as a set of four. Sold separately or as a kit.